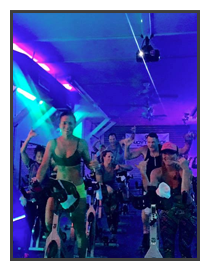 We stumbled onto Enjoy The Ride in Lahaina after relocating to Maui last year – my husband and I have been long-time avid riders both outdoors and taking classes at various studios on the Mainland, and wanted to continue our workouts here on Maui. We searched online and found reviews for Enjoy The Ride on TripAdvisor – all 5 stars and very enthusiastic! So we signed up and have been devoted members ever since. It was great to find such an amazing, motivational studio here on Maui. We’ve had a class with every instructor at least once, and we have to say they are all fantastic. The music couldn’t be better, and it’s really just a fun and welcoming atmosphere every time we go.